Astronomers using the HARPS planet-hunting machine at ESO's La Silla Observatory in Chile have made the first-ever direct detection of the spectrum of visible light reflected off an exoplanet. These observations also revealed new properties of this famous object, the first exoplanet ever discovered around a normal star: 51 Pegasi b. The result promises an exciting future for this technique, particularly with the advent of next generation instruments, such as ESPRESSO, on the VLT, and future telescopes, such as the E-ELT. The exoplanet 51 Pegasi b lies some 50 light-years from Earth in the constellation of Pegasus. It was discovered in 1995 and will forever be remembered as the first confirmed exoplanet to be found orbiting an ordinary star like the Sun. It is also regarded as the archetypal hot Jupiter—a class of planets now known to be relatively commonplace, which are similar in size and mass to Jupiter, but orbit much closer to their parent stars. Currently, the most widely used method to examine an exoplanet's atmosphere is to observe the host star's spectrum as it is filtered through the planet's atmosphere during transit—a technique known as transmission spectroscopy. 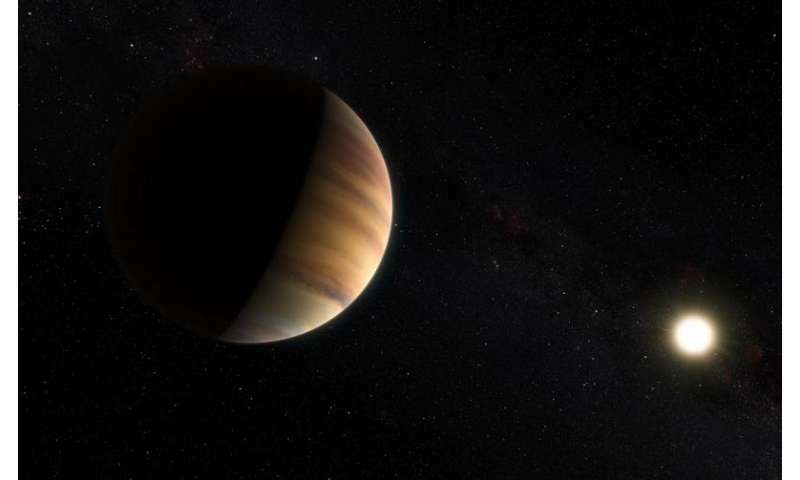 An alternative approach is to observe the system when the star passes in front of the planet, which primarily provides information about the exoplanet's temperature. The new technique does not depend on finding a planetary transit, and so can potentially be used to study many more exoplanets. It allows the planetary spectrum to be directly detected in visible light, which means that different characteristics of the planet that are inaccessible to other techniques can be inferred. The host star's spectrum is used as a template to guide a search for a similar signature of light that is expected to be reflected off the planet as it describes its orbit. This is an exceedingly difficult task as planets are incredibly dim in comparison to their dazzling parent stars. Jorge Martins explains: "This type of detection technique is of great scientific importance, as it allows us to measure the planet's realmass and orbital inclination, which is essential to more fully understand the system. It also allows us to estimate the planet's reflectivity, or albedo, which can be used to infer the composition of both the planet's surface and atmosphere." 51 Pegasi b was found to have a mass about half that of Jupiter's and an orbit with an inclination of about nine degrees to the direction to the Earth. The planet also seems to be larger than Jupiter in diameter and to be highly reflective. These are typical properties for a hot Jupiter that is very close to its parent star and exposed to intense starlight. HARPS was essential to the team's work, but the fact that the result was obtained using the ESO 3.6-metre telescope, which has a limited range of application with this technique, is exciting news for astronomers. Existing equipment like this will be surpassed by much more advanced instruments on larger telescopes, such as ESO's Very Large Telescope and the future European Extremely Large Telescope. "We are now eagerly awaiting first light of the ESPRESSO spectrograph on the VLT so that we can do more detailed studies of this and other planetary systems," concludes Nuno Santos, of the IA and Universidade do Porto, who is a co-author of the new paper. More information: This research was presented in a paper "Evidence for a spectroscopic direct detection of reflected light from 51 Peg b", by J. Martins et al., to appear in the journal Astronomy & Astrophysics on 22 April 2015.